Salted Golden Caramel Bars are a fabulous recipe – simple, quick, and completely irresistible once it’s done. A pan of these rarely lasts more than a day at our house; that salty, gooey, buttery deliciousness is too hard to resist. I know salted caramel is a fad from a few years ago, but it’s also a classic – one of those things that will never go out of style. 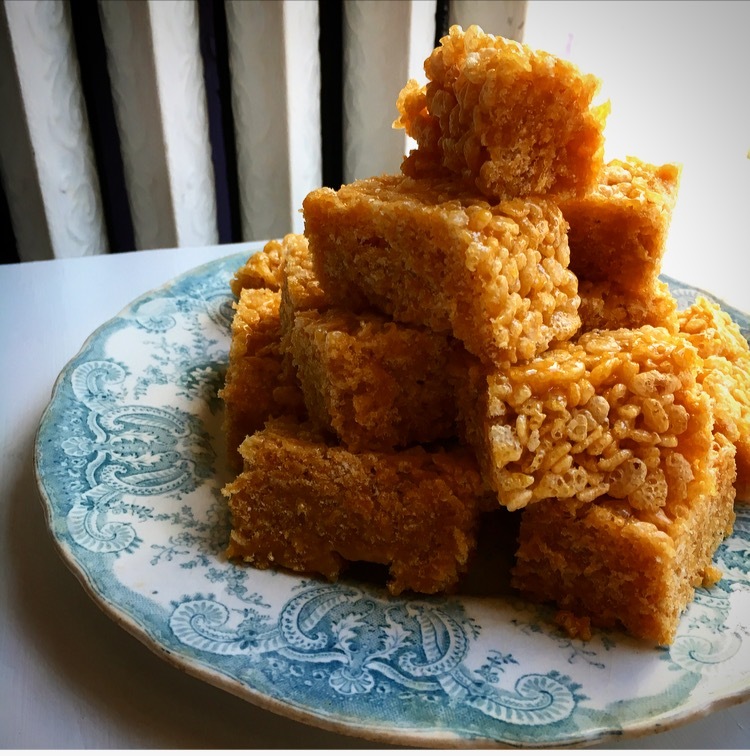 The other great thing about these bars is that they’re essentially glammed-up, slightly more adult, vegetarian Rice Krispie Squares. A lot of people don’t realize that marshmallows aren’t vegetarian (they’re made with gelatin, which is made from bones), and strict vegetarians don’t eat them. These are emphatically no good for you, as they’re mostly made with different variations of sugar and a little butter, but there’s nothing like the occasional treat to make life sweeter. Using vegetable oil, lightly coat a large mixing bowl and a baking dish (approximately 9″x13″). Place cereal in the bowl and set it and the dish aside. In a medium saucepan over medium-high heat combine corn syrup, condensed milk, sugars, butter, and sea salt. Allow mixture to come to a boil while stirring continuously until the mixture becomes a light golden colour (5 minutes or so). Remove mixture from the heat, stir in vanilla, and immediately pour it over cereal. Stir to completely mix, and then evenly spread in the baking pan. Set aside to let it cool; cut into squares and serve. Squares will keep in a sealed container for 4 or 5 days, longer if kept in the fridge.